Bossy Italian Wife : Nice [Cinnamon] Buns! I love cinnamon buns. They are a great way to start the day... especially when you ended the night with a few drinks too many. I find my drinking abilities to be something that waxes and wans... like the moon. Let's just say this was a waxing moment for me and I had tied one on. When I woke up I thought to myself, "Self, we need something sweet and carby for breakfast." It was, after all, 11:30a.m. I am not the kind of gal who feels comfortable going into a grocery and purchasing pillsbury cinnamon rolls. It's just not how I roll. But as many of you might know by now, I am no baker. I am trying, though, and in that spirit, (and my hungover state) I thought I would give these quick cinnamon buns a whirl. I am glad I did. They didn't disappoint! Getting ready! Observe: my new pastry mixer. It was a gift. An awesome gift and it came in really handy in this instance! Alrighty here we go: some serious mixing is about to occur. So far so good--I got me a good dough and all I gotta do is roll it and top it. I love my dough roller. It really does the job. Now's the fun part--the rolling up of the bunny bun bun! YES! Seriously, it was easier than I thought it would be! Baked these in the oven and what do you know?! Hangover solved. Beautifully too if I do say so myself! Served with a nice glass of OJ and I got my blood sugar back to a normal state. Preheat oven to 375°F. In a small bowl stir together 2 tablespoons granulated sugar and cinnamon. Into a large bowl sift together flour, remaining tablespoon granulated sugar, baking powder, and salt. Cut butter into small pieces and with your fingertips or a pastry blender blend into flour mixture until mixture resembles coarse meal. 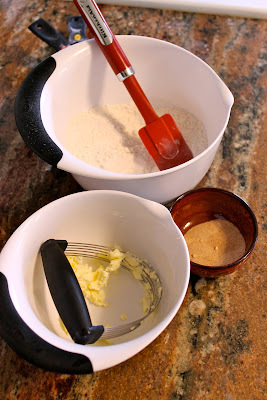 In another small bowl whisk together egg and 3 tablespoons milk and add to flour mixture, stirring until just combined. Transfer mixture to a lightly floured surface and gently knead, 3 or 4 times, until it forms a dough. Pat dough into a 10- by 6-inch rectangle (about ‚ inch thick). Brush dough with some remaining milk and sprinkle evenly with cinnamon sugar. Beginning with a short side, roll up rectangle to form a 6-inch log and cut crosswise into 4 pieces. Arrange pieces on a baking sheet, cut sides up, with seams touching. Bake buns in middle of oven until pale golden and cooked through, about 18 minutes. In another small bowl stir together confectioners' sugar and water until smooth and drizzle over warm buns. Because We "Can Can Can!!!!!!"